As part of this year’s Summer Streets in NYC — an annual celebration of the city’s most valuable public space: its streets! — for three consecutive Saturdays in August, nearly seven miles from the Brooklyn Bridge to Central Park are closed to traffic and opened for people to play, walk, bike, and enjoy. 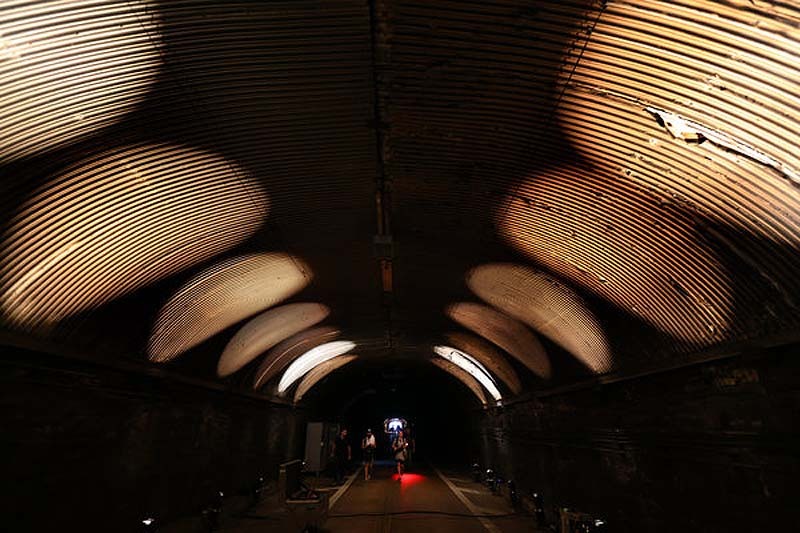 This year, as part of this event the Park Avenue Tunnel which runs from 33rd to 40th Streets, will be transformed into an interactive sound and light installation, Voice Tunnel, by Mexican artist Rafael Lozano-Hemmer (previously here and here.) This rare opportunity to stroll the tunnel will invite participants to walk to a midpoint in the tunnel and deliver short messages into an intercom. The words/sounds will then reverberate out in waves of sound and arching light until they disappear. The intensity of the light will be determined by the pitch and volume of the person’s voice. Voice Tunnel will be taken down after each of the three Saturdays before car traffic resumes, and will be set up again the following week. Other, smaller, interactive installations include Chat Travieso‘s CoolStop at Foley Square, a water mister that connects to fire hydrants made with recycled PVC piping. The 10′ installation resembles a large splash that participants will be able to stand under for a small reprieve from the heat. Also, The Course of Emotions: a mini-golf experience by Risa Puno, that translates everyday feelings into 9 holes of playable fun. Players putt through a range of emotional obstacles, like the seesaw platform of Insecurity and the par-40 Frustration maze. Summer Streets will take place on the first three Saturdays of August (3rd, 10th & 17th) from 7am to 1pm. This entry was posted in Architecture, Art, Fun, Interaction Design, Just Plain Cool, Light, NYC, Street Art, Stuff We Like. Bookmark the permalink.